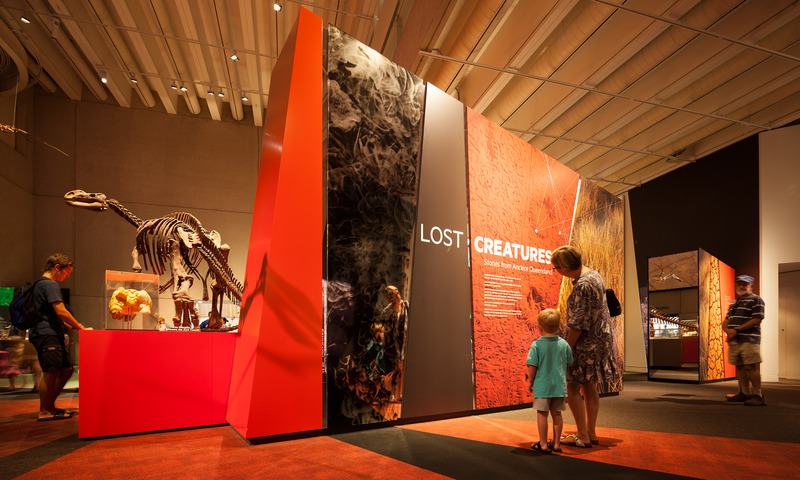 The exhibition explores the environment and creatures that roamed Queensland one million years ago, and the contemporary science and techniques that the Museum’s palaeontologists use to explore this world. The exhibition is a dynamic environment of unique fossil displays embedded with interactive media to form a technology-rich explorative environment. Objects are enhanced with projected overlays, and touch screen media stations contain the majority of the written and image content, allowing visitors to explore the story without the clutter of dense text and image panels. Full-scale projections of the scientific rendered specimens allow visitors to engage with and compare themselves to these historic creatures. The overall design responds to the difficult constraints of a large, cavernous gallery with sound and circulation issues, having multiple entries and amenities within the space. It follows a time line around the room, in a radial pattern marked on the floor with changes in carpet colours. The design also references the bright colours associated with Queensland and incorporates subtle mirror effects that integrate the visitor into the visual story, and aims to breathe life into the inanimate forms. Thylacine worked collaboratively with the Queensland Museum, Mental Media, Illuminated Design and GCD exhibitions to bring this exhibition to fruition. It was our role to design and manage all stages of this project from concept to completion.